I love going to the farmer’s market in the summer. Since we are in a colder climate our farmer’s market is only open from Memorial Day to Labor Day but when it is everyone goes. It’s nice to get fresh produce right from the farmer plus it helps the local economy. Our farmer’s market is every Friday morning which is nice but there is a really big one about 20 minutes away on Thursdays that I enjoy going to as well. 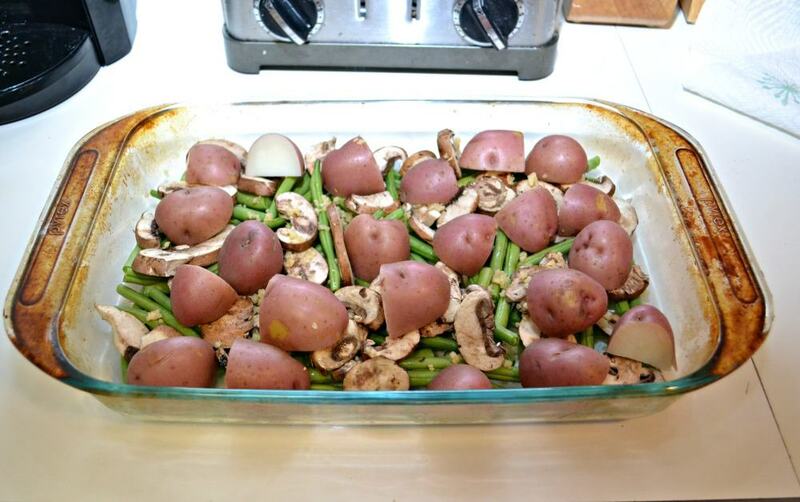 This week at the farmers market I got some lovely mushrooms, red skinned potatoes, as well as French green beans. 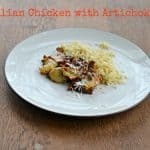 I also have fresh herbs ready to go out in my garden so I wanted to make an easy, light, and fresh recipe using the produce I got at the farmers market. This Lemon Pork Skillet Dinner is easy to make and it’s an entire meal in one pan which makes it even better. 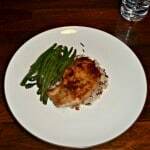 The pork chops, mushrooms, and haricots verts and cooked in a light lemon sauce with fresh herbs. It smelled amazing while it was cooking. I really like cooking one pan meals because it leaves me with less dishes and it’s easy. 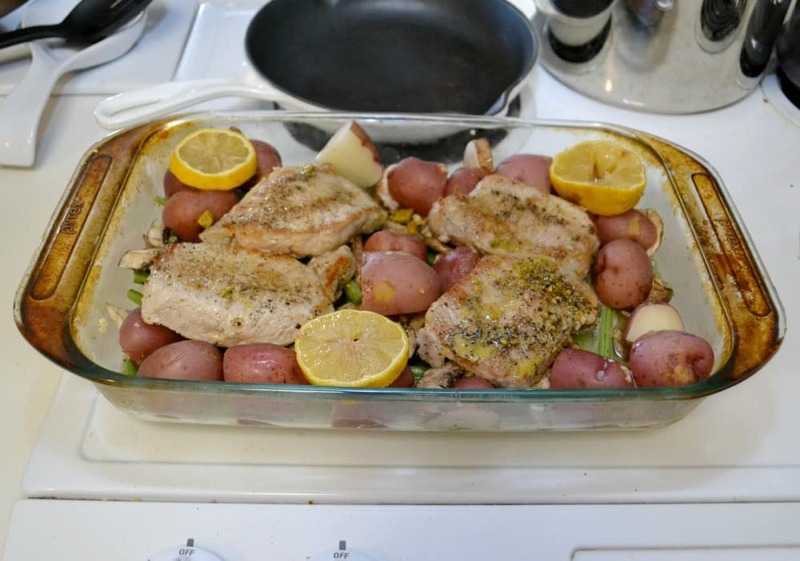 This dish comes out with bright green from the beans, pinkish red from the potatoes and yellow from the lemons. It just looks fresh. 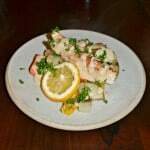 The flavor of the lemon sauce is so bright and refreshing and the fresh herbs really add a pop of color and flavor. 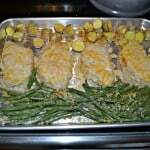 This is a great summer meal. One pot meals are all the rage and this easy lemon pork chops with mushrooms, green beans, and potatoes are a tasty weeknight meal. Place the potatoes in a medium saucepan and cover with water. Bring to boil and simmer for 10 minutes. Drain and set aside. Heat a large ovenproof skillet over medium high heat. Add 1 teaspoon of olive oil to the pan. Sprinkle the pork chops with half the salt and pepper and add to the hot oil in the pan. Cook for 5-7 minutes per side or until they are cooked through. Remove the pork chops from the pan and add remaining olive oil. Add the potatoes, mushrooms, and thyme. Cook for 3 minutes or until browned, stirring once. In a small bowl combine the milk and flour and pour into the pan. Add the remaining salt and pepper, the chicken stock, lemon slices, and beans to the pan as well. Simmer for 1 minute or until slightly thickened. 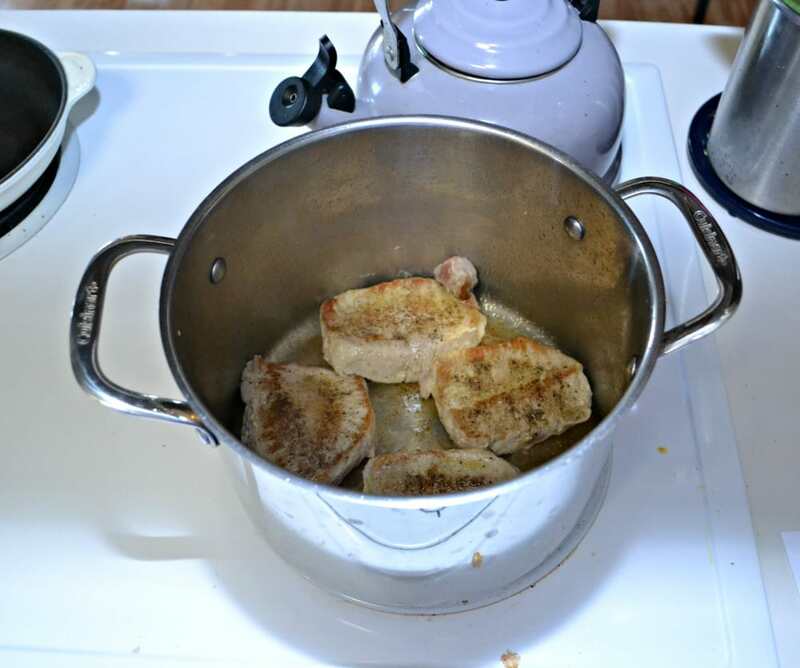 Place the pork chops back in the pan, cover, and reduce heat to medium low. Cook for an additional 5 minutes. Sprinkle with fresh parsley and serve.